What Does Excessive Drooling in Cats Indicate? Cat drool may seem unpleasant, but it isn't always a cause for concern. A responsible cat owner should understand why cats drool and when it's time for medical help. 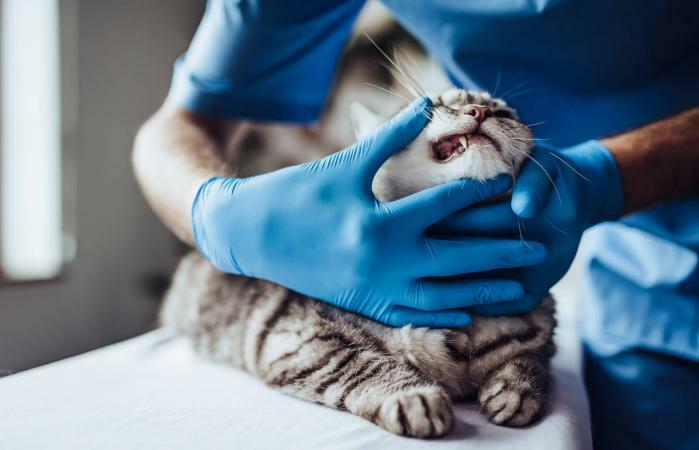 Dr. Amy Learn, VMD of Hanover Veterinary Services in Mechanicsville, VA says: "Dental disease is extremely common in domestic cats and can be significant by the time they are three years of age." You may think that your cat looks fine, but a medical checkup is required. "It may not be easy to see from the outside, but a veterinarian will look at the teeth, gums, tongue and pharyngeal region for any sign of disease, infection or tumor." The consequences of untreated dental problems can range from pain and a poor appetite to loss of teeth, infections and damage to other organs including the heart and kidneys. Cats can get items stuck in their mouths or in the esophagus that become stuck. Drooling is caused from the discomfort the cat is feeling from the object. Common examples can be a string from a cat toy caught in the cat's teeth or tongue, or a small item breaking off from a toy they accidentally swallow. A veterinarian can help dislodge the object for you. If this happens with your cat, be sure to monitor toys for loose parts or string and find safer alternatives. Dr. Learn advises that "another serious reason for drooling can be toxin ingestion. Be very careful what your cat is exposed to. Many plants, like Easter Lilies, can be toxic." Even substances that are not poisonous can cause a cat to drool if the cat doesn't like the taste, such as medications prescribed for your cat. Cats, particularly adventurous kittens, can get into cabinets, doors and boxes all over your house. If you have any plants, chemicals, foods or human medications that are known to be toxic to cats, make sure you "cat-proof" your house to protect the curious cat. Brachycephalic cats - those with "flat faces" like Persians - can be more susceptible to hot weather. A cat suffering from heat stroke can drool along with several other symptoms such as panting, vomiting and lethargy. It's always safest to keep your cats indoors, but if you have an indoor/outdoor cat, make sure they have access to lots of water and keep them inside on days with high temperatures. If a cat is nauseous they can drool along with other symptoms like panting, vomiting and hiding. Common situations when a cat might be nauseous are from motion sickness in the car or from the side effects of health conditions. Dr. Learn reports that "systemic diseases can cause drooling. It may be a sign of nausea which can be caused by kidney disease, pancreatitis, constipation or even a foreign body ingestion." Medications prescribed for health conditions by your veterinarian may induce nausea as well. How a cat feels can also lead to drooling. Cats that are feeling stressed may drool until their anxiety level dissipates. On the other hand, Dr. Learn says it's "perfectly normal" for cats to drool "when they are so happy to be with you or just before meal time." A common scenario for kitty drool occurs when your cat is enjoying your company while kneading her paws on you and purring up a storm. While some types of cat drooling are normal, a trip to your veterinarian is recommended to rule out any potential issues, especially if this is a new behavior with your cat. Drooling can be a warning sign of many types of diseases and dental problems that may not be visible to you until it's too late for medical intervention.